Ecopsychoanalysis represents a step forward in attempting to theorise the links between psychoanalysis, ecology, emerging post-nature, vibrant objects and wider environmental issues and concerns. There is always a danger that by sticking 'eco' in front of anything we are attempting to make some trite territorializing manoeuvre, somehow turning psychoanalysis towards some Gaian notions of holism, often equated with some forms of ecology - see Adam Curtis documentary: http://www.bbc.co.uk/programmes/b011k45f this is not our intention. The work of ecopsychoanalysis is to further this project. 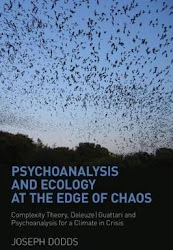 Joe's forthcoming book also tackles some of these issues http://www.psychotherapyarena.com/psychoanalysis-and-ecology-at-the-edge-of-chaos-9780415666121 and represents part of the project of ecopsychoanalysis. The 'becoming' of ecopsychoanalysis makes deliberate reference to the philosophies of becoming , most notably Gilles Deleuze and Felix Guattari, alongside others such as A.N. Whitehead, Bergson, Spinoza and contemporaries like Isabelle Stengers and Bruno Latour. Others we see as important in this area are Timothy Morton and the development of dark ecology and object oriented ontology (OOO). As psychoanalysis is by no means a unified field, ecopsychoanalysis should not be seen as a theory, more a concept which falls into streams of thought, folding and unfolding on a plane of immanent becomings.. It could be seen more as a toolbox, as in the way the Brian Massumi posits Deleuze and Guattari's thought, in this sense ecopsychoanalysis is a set of circumstances at a volatile juncture, a point of application of force moving through space at a given velocity in a given direction, and following (very heavily) from Massumi's thought on this its acts as a form of crow bar in the willing hand that envelopes an energy of prying. In this sense it can be seen as an energetic location which fuels the act of understanding which will help us to take lines of flight. Concluding with Massumi we just need to ask what new thoughts does ecopsychoanalysis make it possible to think?